Street style London Fashion Week Men's is everything and then something extra! How did they go from bespoke to this kind of high-fashion innovation? Hot off the press we bring you the street style London Fashion Week Men's that truly stimulated our imaginations and incited us to want to know more about these amazing individuals. The thing that impresses me the most about this platform is that London comes from the most traditional place of refinement in bespoke, where there is a rule attached to literally almost every fine thread that makes up a suit. I don't even know if it can be attributed to any one thing in particular, but somewhere over the course of the later part of the 20th century a thriving high-fashion subculture emerged that had and still has no regard or attachment to the "rule book of bespoke fun." If I had to pick any one movement that contributed to the proliferation of creativity and possibilities it would have to be the British Rock and Roll music culture that takes main-stage. Now London is the mecca for high-end luxury cutting edge high-fashion. The street style London Fashion Week Men's turned out is even more progressive every year, although the creativity seen in Milano is also without equal, it is a completely different story altogether. The whole vibe is different. 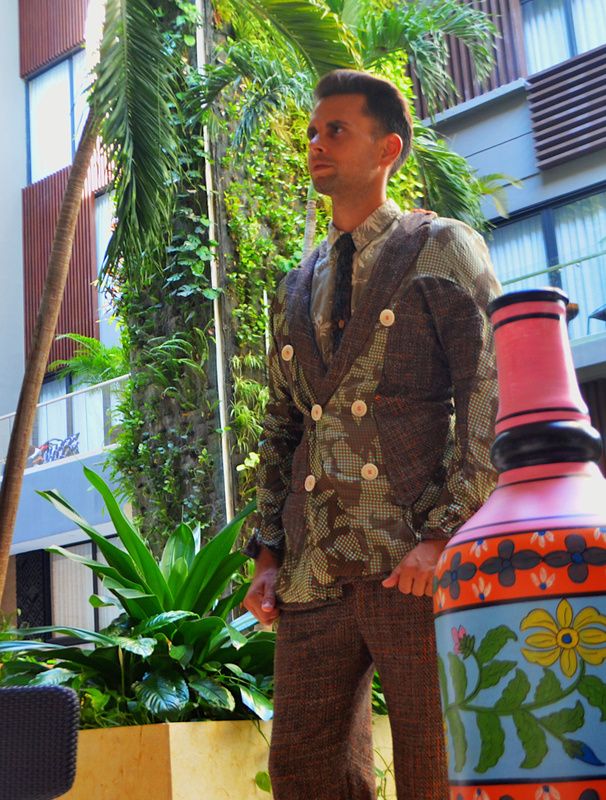 Cal loves merging bespoke with high-fashion innovation like a London Native. "Can you see the forest through the trees?" Which side of this jacket do you like better? Vote like a street style London fashion week critic. 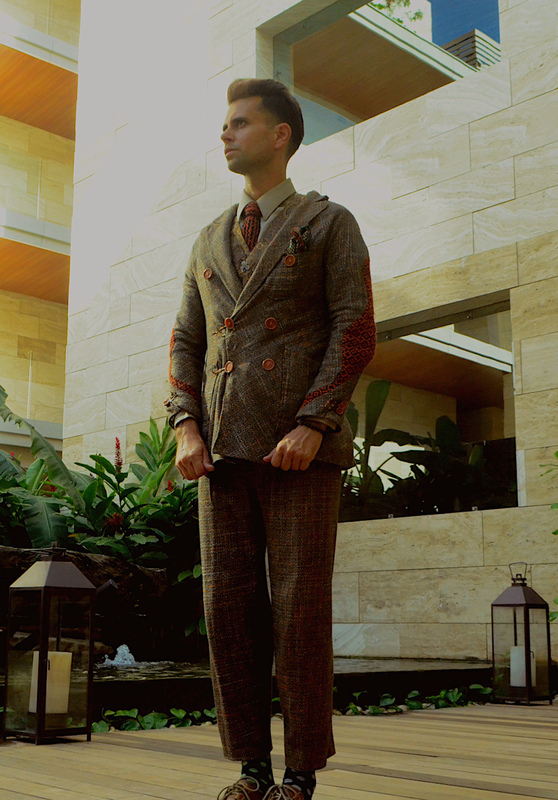 Bespoke wool and silk suit with a creative cut and interesting design features via GSb wearables. Bespoke wool and silk suit with a creative cut and interesting design features with reversible lining worn inside out via GSb wearables. #1 Outside back with forest design and seamless shoulders. 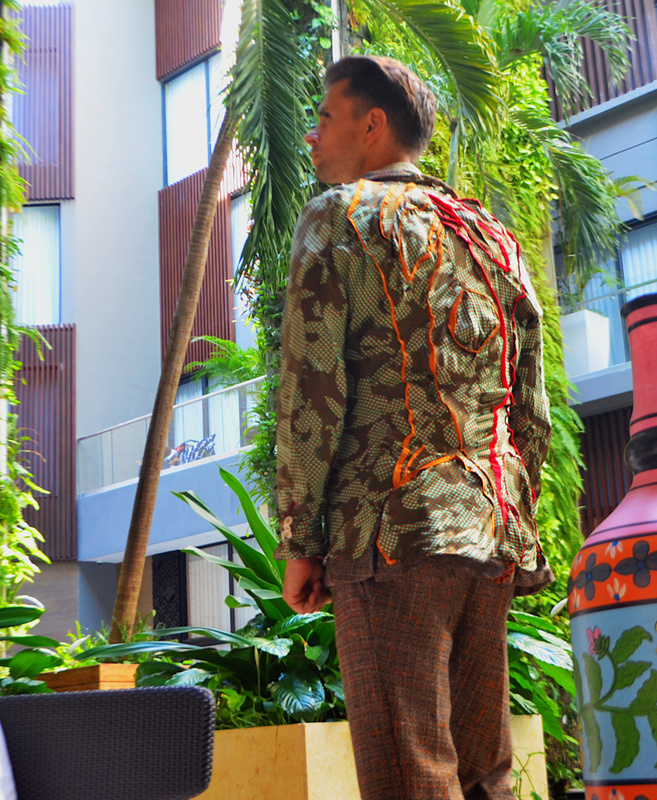 The backside of Bespoke wool and silk suit with a creative duality forest design cut with reversible lining worn inside out via GSb wearables. #2 Inside-out back with forest design and seamless shoulders. 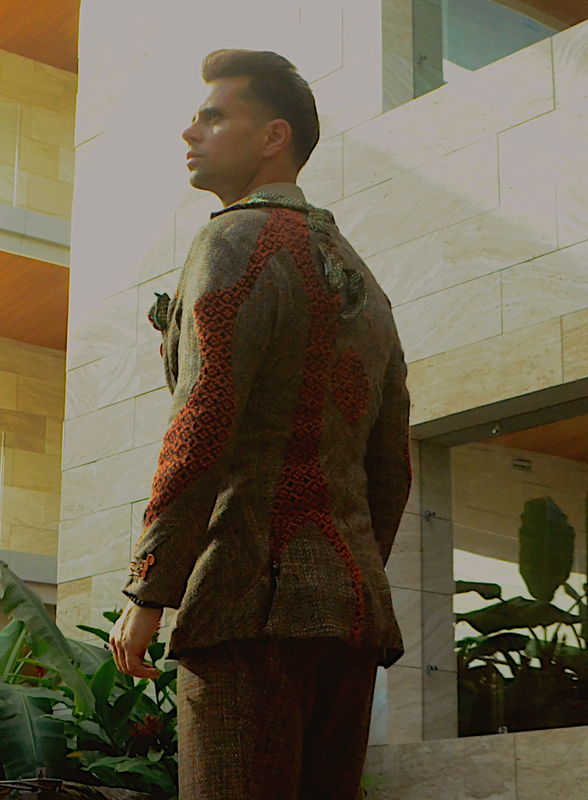 The inside reversible lining backside of Bespoke wool and silk suit with a creative duality forest design cut with reversible lining worn inside out via GSb wearables. Call for a few new benefactors. Establish Eco-Sustainable Training center and supply depot for artisan work-from-home mom's in Tulum Mexico. Expand our fashion labels into Milan. Expand our fashion labels into Dubai. Do you have properties, resources, means, or services that you can donate or lend for trade? Cal is gifting new benefactors with a complimentary custom wardrobe yearly package with a corresponding value to donated resources. Fine Handmade Bespoke Clothing, Styling Services, Tailoring Services, and Personal Shopping Services. contact Cal at cal@j-nacustomgsb.com for inquires.